The skills for the database are broadly set and include: Acting, Voice, Movement, Singing, Directing, Dramaturgy, Dance, Ballet, Playwriting, Puppet theatre, Shadow theatre, Opera, Music theatre, Musicals, Radio plays, Theatre for development, Theatre of the Oppressed, Theatre for education, Theatre for Children and Young Audiences, Events management, Management of theatres or theatre companies, Marketing and Public Relations, Sponsoring and fundraising, Copyright and legal issues, etc. If you are a qualified trainer, you can download and fill out our >>application form. 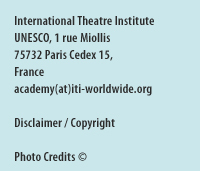 Make sure you send the completed form to academy(at)iti-worldwide.org. We will review your submission and contact you for further information. For any other questions, feel free to send us a message using the online form below.